Won’t You Be My Minion? Blog Improvement Project, Part 4: Surprise! You may all have gathered at this point that my four-post-long account of our adventures after the DC Metro area storm cut our power was a bit … embellished. The truth is, it was just three days without power, sleeping at a friend’s house (B, C, and S are all actual people), and then another week or so of internet connectivity problems. Tumultuous and interesting to live through, but to write about? Not so much. So I added zombies. After all, if this blog is about me and my life, I want to make it as interesting as possible. Now, I’m dealing with other stuff that is interesting to me but not so interesting to write about. The main thing being that the play I’m in opens tonight. This is both unbelievably exciting and also terrifying. Look! We have a poster and everything! See, I majored in theatre in college. I did a semester abroad at a fairly exclusive acting conservatory program in London, and I spent a summer as an acting apprentice at a regional Shakespeare theatre. When I graduated college, my acting chops were FIERCE. Once I moved to Baltimore and had Sausage on the outside of myself, I started acting again. 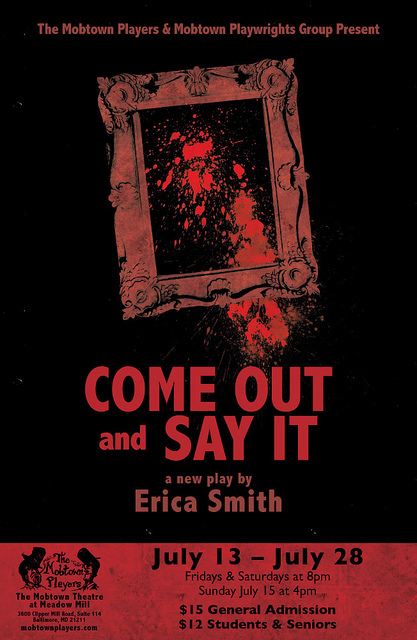 I’ve done one small-scale production with my brother’s theatre company and two staged readings. But this is my first full production with an established company which has an administrative/artistic board consisting entirely of people to whom I’m not related. This is why I’m terrified. Yes, I’ve made it through the whole rehearsal process without anyone suggesting that my part should be recast (at least in my hearing), and I feel like I’m managing to keep up pretty well with the incredibly talented, experienced professionals with whom I’ve been working. But those acting chops that I used to take such pride in still feel awfully rusty. So I guess this post is mostly just me whining about being insecure and afraid of failing to live up to my own abilities. Or it would be, if I hadn’t bought myself a rather lovely and exciting Opening Night present. Look at your URL bar. You should have been automatically redirected from dontforgettofeedthebaby.wordpress.com to dontforgettofeedthebaby.com. That’s right — Don’t Forget To Feed The Baby now has its own domain. Huzzah! I am the ruler of my own domain! You may now call me ‘Highness’. ‘Majesty’ and ‘O Glorious One’ will also be accepted. 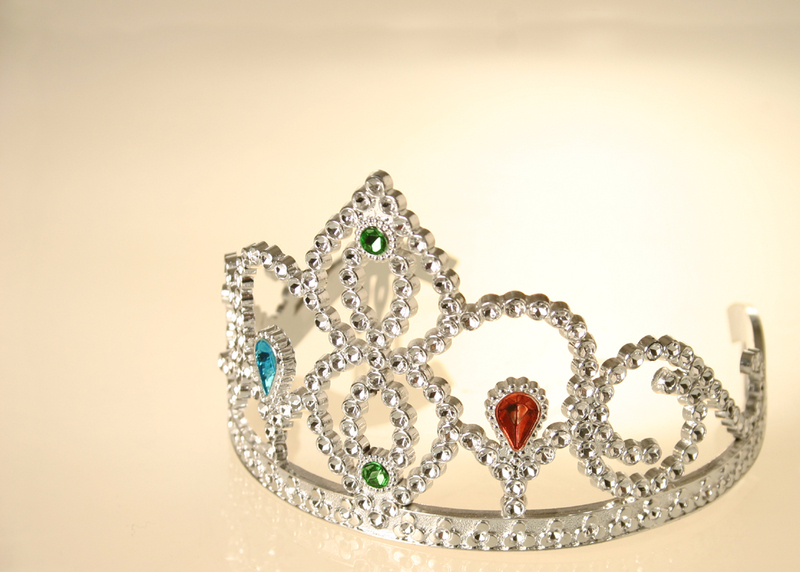 I’ll be the blogger wearing a tiara with her pajamas. I hereby also proclaim my right to chop off heads. I have a feeling that if you tune in at random times over the next few days, things might look different. Don’t worry. I’ll probably play around with custom settings and things like that for a while, but the blog’s appearance is bound to settle down eventually. Well, until I get bored. It’s a queen’s prerogative to change things as she sees fit, you know. Somehow, this little present is making me feel better about tonight’s show. I won’t f*ck the whole thing up. It will be awesome, and I will make myself proud. And if not, I can come back here and vent my frustration by chopping off all of your heads. Mwahahahaha! Many thanks to all of you who played along so entertainingly with my little poetry-based giveaway! It was so much fun that I’m considering requiring you talented reader-types to write ALL of your comments in verse. Okay, maybe not. But I’ll always be happy if you should choose to grace my page with more of your wonderful wordsmithery. Entries are no longer being accepted. A winner has been chosen! I used a completely random and scientific method to choose the winner. 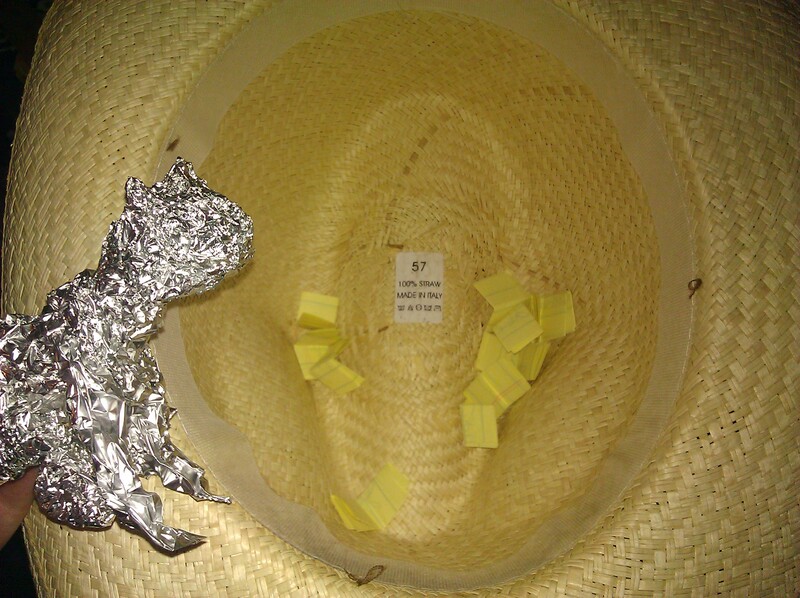 First, I put all the entrants’ names onto little yellow slips of paper, which I then folded up tiny and tossed into a very ugly hat of my Loving Husband’s. The cat oversaw all the proceedings, in order to ensure fairness. Then I tossed the paper wads like I was tossing a yummy salad. Not too hard, I didn’t want any of them to fly out of the hat; just hard enough to thoroughly coat them in the dressing randomize them. Then I shut my eyes tight-tight-tight-no-peeking, and picked a winner. Congratulations, Maggie O’C! 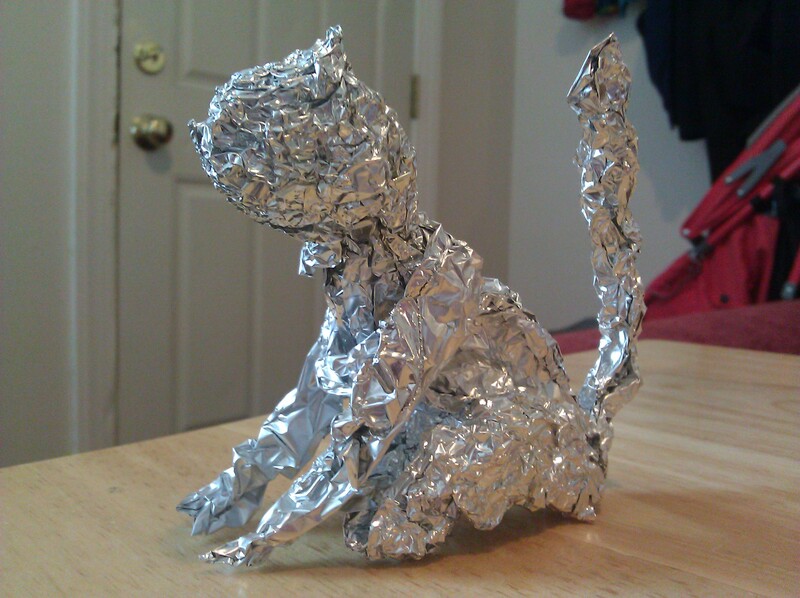 You’ve won a copy of “To What Miserable Wretches Have I Been Born?” by Suzanne Weber, and a rather fair-minded little aluminum foil kitty, made by me myself. To claim your prizes, write me a comment with your preferred means of contact (preferably an email address) — since all my comments are moderated, and since I’ll delete it once I’ve contacted you, your information will remain just between us. We’ll hash out the mailing stuff over email. Now that the fun stuff has been addressed, I have a small order of business to discuss with my lovely followers. I have a funeral to go to this weekend, out of state. I’ll be sad, and I’ll also be largely without access to the internet — which won’t help with the sadness, let me tell you. So I’ll be largely out of touch through Tuesday or so. Then I’m going to the wedding of a dear old friend (she’s not actually old, but we’ve been friends since 8th grade, so she’s old to me), which won’t be at all sad, but which is also out of state, for the last half of next week and that weekend. I may have internet access then, but I’ll be busybusybusy with all the carousing. Which will leave me out of touch from Wednesday afternoon until about the following Monday. What this means for my bloggy friends is that I won’t likely have much time for reading or commenting on your blogs — fear not, you are not unloved, and I’ll bring back my snarky and often-inappropriate commentary as soon as I’m back. I’ll try to keep up with responding to comments on my own posts, but it may be a bit intermittent. If you’ve liked my fan page on Facebook (CLICK CLICK CLICK CLICK HERE), I will try to keep up with posting there, so you shouldn’t get the shakes or anything from all the withdrawal. What it means for the general readership is … well, not much. I’ve set up some re-posts from before anybody was reading my blog, so there will be content coming out all of next week, and it will most likely be new to you. There will be more poetry; a bit of speculation about a medical disorder that I have, in my infinite skill, identified; and poo. Oh yes, there will be poo. So you see, I’m not leaving you entirely bereft. I have a list that I’m following in this Blog Improvement Project. I’m not going to share it with you, because I might change my mind about doing certain things, or decide to do them in a different order, or I might just blow the whole damn thing off altogether, and I don’t want you to be disappointed. Because I love you. It’s a cat! Kitchen wraps are my true artistic medium. Plus a special bonus shot of my thumb. You’re welcome. So I bought two copies. And it’s a shrine of snapshots of the next victim? The walls are covered in pictures. And the next target of his (or her) fixation is me. This makes me uncomfortable, to say the least. One that can only end very, very badly. That poem actually inspired me to immediately, do-not-pass-go-do-not-collect-two-hundred-dollars, deal with the pictures of Sausage that I had plastered all over the living room wall for his birthday party (one taken during each month of his little life — adorable, yes?) and then proceeded not to take down. I mean, I knew it was creepy, but I hadn’t thought of it in terms of serial killer. So now three of them are properly framed and hanging with other family pictures, and the rest have been taken down and neatly stacked for future use. I left the Star Wars Happy Birthday banner, though, because that’s just fancy. So. This book has already changed my life. Or at least my living room. And in case you’re STILL not convinced that you need to read this book, I’ll actually tell you a few things about it. 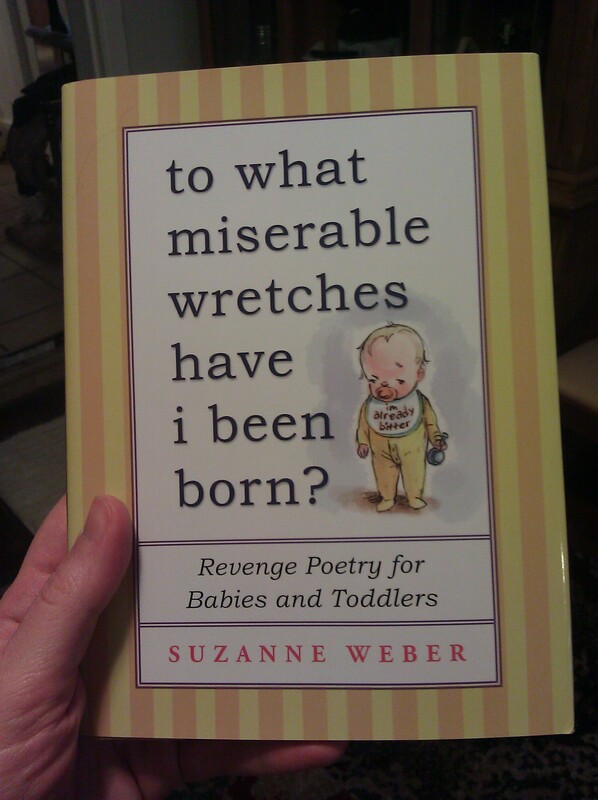 It is short, it consists entirely of poetry told from a baby/toddler’s point of view, it is HILARIOUS, and it has a yellow cover. Look! I did a book review! I can tick that box now. And now for the giveaway part. Leave me a comment. It must be in verse*. It doesn’t have to rhyme or anything, though that would be AWESOMETASTIC. At the end of the week, I will use a random number generator to pick one happy winner (you can comment all you want, but you only get one entry). 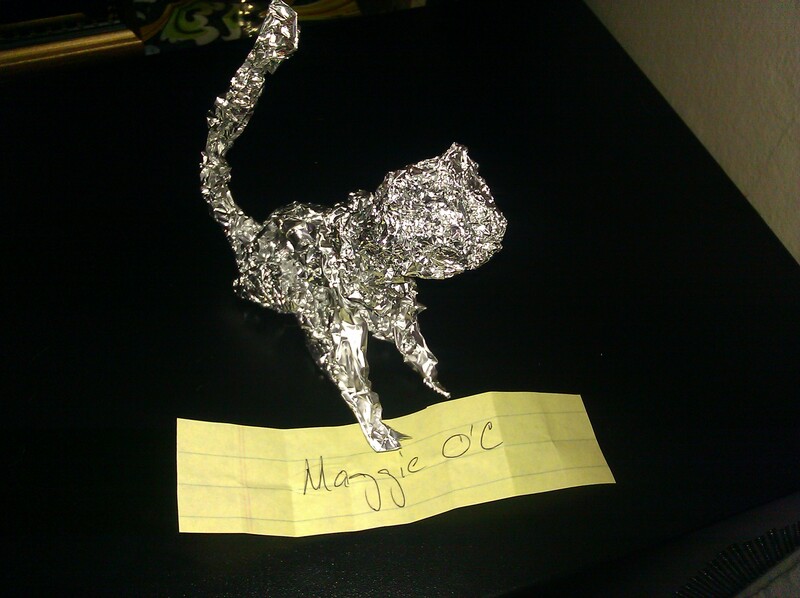 This winner will receive in their very own mailbox a copy of the book, “To What Miserable Wretches Have I Been Born?” by Suzanne Weber, as well as my little aluminum foil kitty cat. YOU KNOW YOU WANT IT. *Note: It doesn’t have to be in GOOD verse. This is all just for funsies. As long as your comment is poetry-esque, you qualify for a chance to win these fabulous prizes.